This viral photo of Unilorin students have been raising eye brows online. 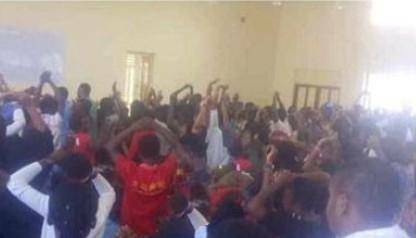 It was reported that a lecturer punished the 400l students of a department for noise making by instructing them to raise their hands. The lecturer's action has sprang up mixed reactions online. Some are of the opinion that students in higher institutions shouldn't go through this kind of humiliation and they are supposed to be treated as adults while, others have blamed the Nigerian education system for such actions.